Show off your birth month with style by wearing these gorgeous Blue Rose September Stud Earrings. Bold and charming in design, the deep blue petals are contrasted by the dazzling sparkle of Austrian Crystals sorrounding it. 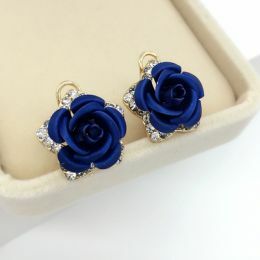 The earrings are 2.0*2.1cm in size and the petals are made from imported Eco-friendly alloy. Buy a pair for yourself or for that special September baby in your life!